They say that apples don’t fall far from the tree. It’s a metaphor used for explaining the behaviors of parents and their children. Most of the time, the apples remain close to the tree unless they are carried away by an animal or roll down a hill. I don’t know what happened to Mitt Romney as he lacks the integrity that his father displayed. 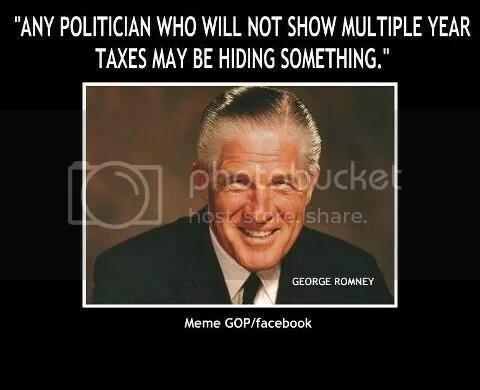 This is what George Romney had to say about politicians and taxes. Perhaps Mitt does have something to hide. This is our Open Thread. What do you think? Speak Up! A sidebar article at US NEWS & World Report caught my eye yesterday. How could I resist the headline, “Evangelical, Baptist Churches To Hold Massive Gathering Before Democratic Convention”? Charlotte714 is a call to the Church of Charlotte to a 40 day fast culminating with a special city-wide gathering the night before the Democratic National Convention on Labor Day Weekend. Charlotte714 is not a political event or a protest or demonstration. It is a gathering of believers seeking spiritual renewal in the church through biblical repentance. We humbly bow in Jesus’ name requesting that He hear from heaven, forgive our sins, and heal our land. No, no political agenda there. David Benham is described on the Benham website “As a follower of Christ, he believes the marketplace is a powerful venue to impact lives.” “By remaining true to our core principles, despite the economic circumstances, we’ve grown our company by faith instead of it simply growing because the market is strong”. On Jason Benham’s “about” page, “BENHAM Companies exists to build, strengthen, and reproduce the heart of Jesus Christ in believers around the world by teaching them to be Kingdom Builders in the marketplace and to give abundantly to His work on the earth.” Hmm, sounds a bit C-Street-ish to me. So, this is a “non-political” evangelical/fundie gathering, the day before the Democratic National Convention, organized by a corporation/ministry, that just happens to be closely connected to OR/OSA. If it’s ‘non-political’, then why can’t I find any indication that this same group is gathering before the Republican National Convention? Maybe they feel that one big prayer meeting will be enough for Jeebus to ‘hear them’ and act to ‘heal our land’? I had to laugh at this one: Operation Rescue/Operation Save America issued a “Press Release” stating: “Operation Save America Prepares for Invasion of DNC: “The DNC is coming to Charlotte, bringing its “culture of death!” Read some of the rest, about the blood running in the streets – somebody’s on some nasty drugs there. This is our daily open thread — Whatcha thinking about? P.S. – Here’s some interesting info on Tampa Bay’s preparations for the upcoming RNC there. 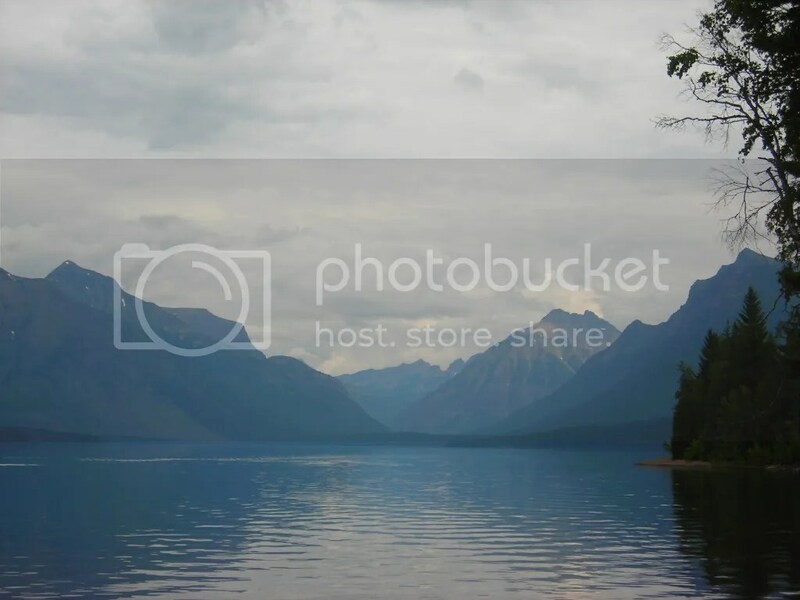 Scraped into the Earth by the massive power of gigantic glaciers and the insidious power of erosion, Lake McDonald is the largest lake in Glacier National Park. It’s ten miles long, and its surface covers over 6000 acres. 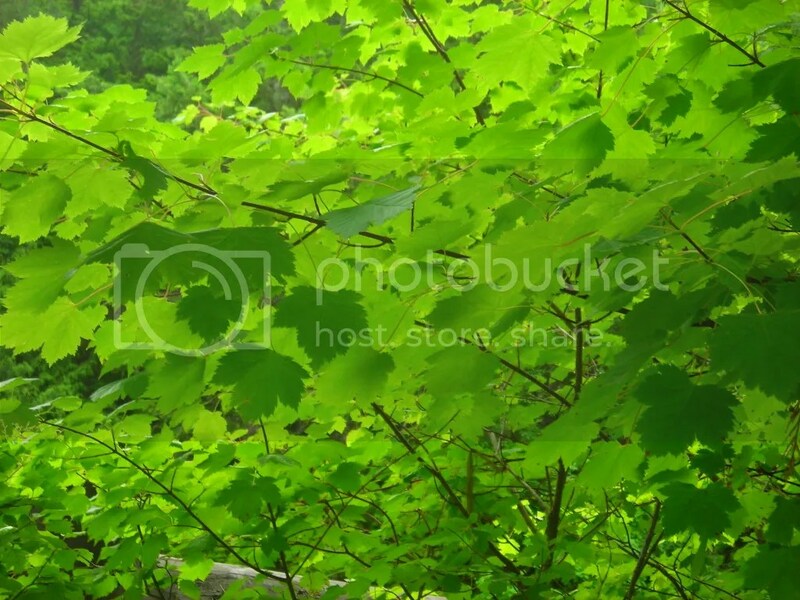 This is one of the last pictures I took in the park, having walked down a small embankment to the water’s edge. The shadows cast due to the lowering Sun made me understand the meaning of “purple mountains majesty.” The quiet was interrupted only by the occasional car on the Going to the Sun Road, and the chatter of a raven in the tree tops, which seemed to be my constant companion on this trip. The water was cold, clear, and almost still. 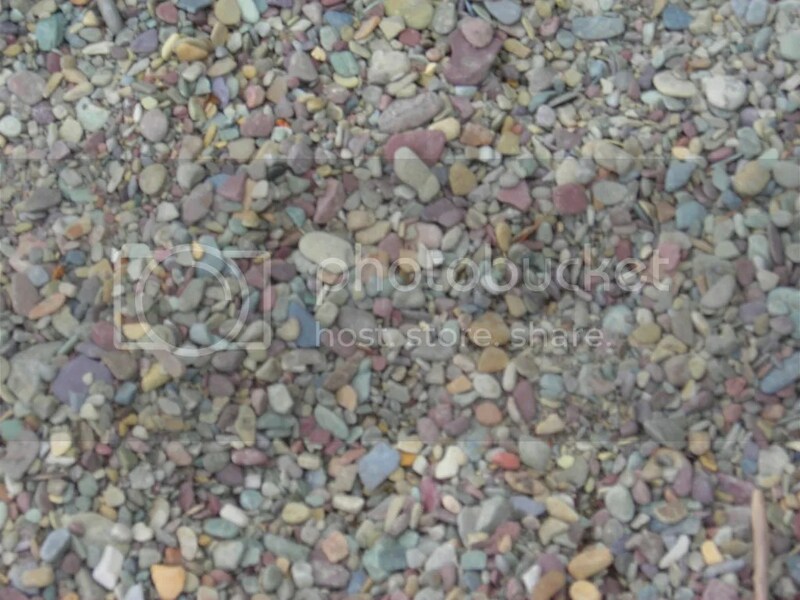 Beneath my feet was not the sand I expected, but small pebbles of grey, blue, pink, cream, and white, that were flat with rounded edges. Imagine the constant, unrelenting force that turned mountains into pebbles. Last picture of the trip. Time to hit the road, Honeybump. This is our daily open thread — What’s up in your world? The Watering Hole – Saturday, July 28th, 2012 – Busted! It seems Mitt Romney has a small problem with his advisers. If they exist, they lie about as much as Romney does. They’re also just as cowardly, as they chose to anonymously spew lies about the President of the United States while on foreign soil, which I thought was supposed to be a major no-no (at least, the Republicans see it that way.) The latest little twist of reality involves the famous bust of Sir Winston Churchill that was on display in the Oval Office during the Bush Administration. It appears that the Right Wing has gotten its knickers in a twist claiming that Obama insulted the Brits by returning the bust when he took office and refusing an offer to keep it. The problem is that, as is often the case in things that upset the RW, it is not exactly true. To make matters worse, famous RW crap spewer Charles Krauthammer repeated this twist on reality in one of his columns, which enabled the Romney advisers to anonymously and, in a cowardly fashion, repeat it to British reporters. It didn’t help that the White House initially said that this bust was not returned to the UK at all but is on display in the White House residence. This is slightly inaccurate, as well, but not as egregiously wrong as the lie that Obama was deliberately insulting the Brits by returning it. The White House has had a bust of Winston Churchill since the 1960’s. At the start of the Bush administration Prime Minister Blair lent President Bush a bust that matched the one in the White House, which was being worked on at the time and was later returned to the residence. The version lent by Prime Minister Blair was displayed by President Bush until the end of his Presidency. On January 20, 2009 — Inauguration Day — all of the art lent specifically for President Bush’s Oval Office was removed by the curator’s office, as is common practice at the end of every presidency. The original Churchill bust remained on display in the residence. The idea put forward by Charles Krauthammer and others that President Obama returned the Churchill bust or refused to display the bust because of antipathy towards the British is completely false and an urban legend that continues to circulate to this day. So, as usual, the RW is taking a non-issue and trying to turn it into an international incident. This is our open thread. Feel free to discuss any topic you want. Abigail Washburn and Bela Fleck married secretly in 2009. This union of fine musicians brought together widely differing styles of banjo, hers from the folk and bluegrass genre, and he (though starting in bluegrass with the New Grass Revival) offers banjo influenced heavily by jazz and world rhythms. They play separately within their own styles and sometimes together as part of the Sparrow Quartet. On this date in 1890, 122 years ago, the greatest painter who ever lived, in my humble opinion, shot himself in the chest. He died two days later of infection. 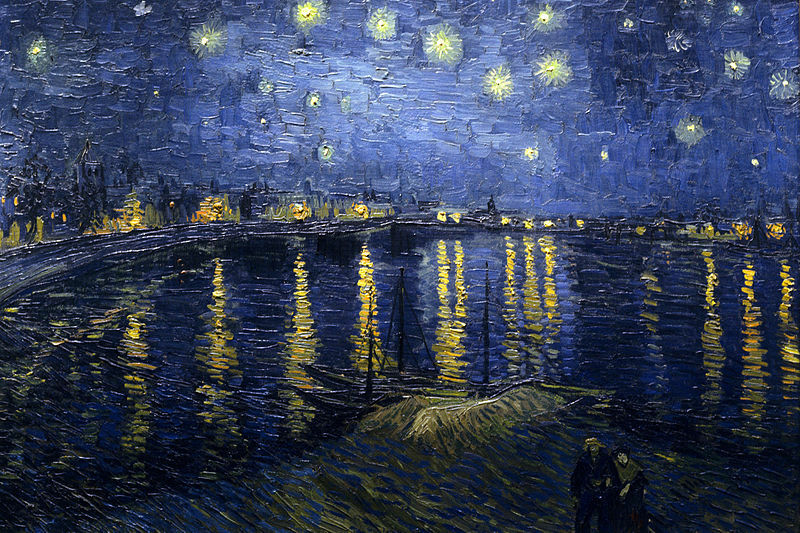 There is some speculation that van Gogh did not shoot himself, that he was accidentally shot by a third party, or accidentally shot himself. One thing is for sure, we’ll never really know. Diagnoses include schizophrenia, bipolar disorder, syphilis, poisoning from swallowed paints, temporal lobe epilepsy and acute intermittent porphyria. Any of these could have been the culprit and been aggravated by malnutrition, overwork, insomnia and consumption of alcohol, especially absinthe. Whatever it was, van Gogh’s was a tortured soul. I wonder if he would have been a better painter with a healthy mind? Maybe, maybe not. It’s my thought that our experiences — social, physical, and psychological — bring us to any given point in our lives, and everything we do is colored by those experiences. For van Gogh, his experiences and talent led him to an amazingly productive period in his life, even as his mind was slipping away. It seems he did the only thing he could do — paint beautiful pictures. I used to think that our life experiences always brought us to where we needed to be, and that it was usually a good thing. I no longer think it works that way for everyone, and I think Vincent van Gogh might agree. “By setting these votes at a 50-vote threshold, nobody on the other side can hide behind a procedural vote while leaving their views on the actual bill itself a mystery to the people who sent them here,” McConnell said. Moreover, McConnell said, the tax bill cannot advance because it is a Senate-originated tax measure. The Constitution requires all tax measures to originate in the House. Yes, Mitch, it shows the people who sent you there that you stand against them, as poll after poll indicates that the vast majority of Americans are in favor of letting the Bush tax cuts for the extremely wealthy expire. Yeah, you show ’em, Mitch. “Discussion”? That was no “discussion”, Mitch, it was a deliberate act on the Republican’s part to undermine both President Obama and the American economy. The same ThinkProgress 2011 post continued, “The debt ceiling has been raised dozens of times in the past without controversy, including 19 times under President Bush alone. President Reagan increasing the debt ceiling by 199.5 percent during his eight years in office — more than any executive to date — while Presidents Bush, Jr. raised it 90.2 percent and Bush Sr. increased it by 48.0 percent.” Of course, as everyone knows, IOKIYAR. “…didn’t just hurt the economy or disrupt the economic recovery, halt job growth, and wreck consumer confidence. It also cost taxpayers $1.3 billion and counting, according to the Government Accountability Office [GAO]. The nonpartisan Government Accountability Office said Monday that the $1.3 billion in costs came as the result of increased borrowing costs for the Treasury Department. This is our daily open thread — ladies and gentlemen, start your discussion!